Girl Kuripot Girl Kuripot: Who Wants Katy Perry Prismatic World Tour Manila Concert Tickets? Who Wants Katy Perry Prismatic World Tour Manila Concert Tickets? This is a chance to win 1 of 4 Katy Perry Prismatic World Tour in Manila concert tickets! Buy a Sakura JCC Milk Tea and pose with your drink in front of the Katy Perry concert poster in any of these TBT branches: SM Megamall, SM North Edsa, Tomas Morato, Wilson Greenhills, The Fort and Katipunan. Post your photo in Facebook with the hashtags #tokyobubbleteaSakura and #ThePrasmaticWorldTour. You have until April 30, 2015! Check out the 3 Tokyo Bubble Tea Sakura JCC Milk Tea flavors here! 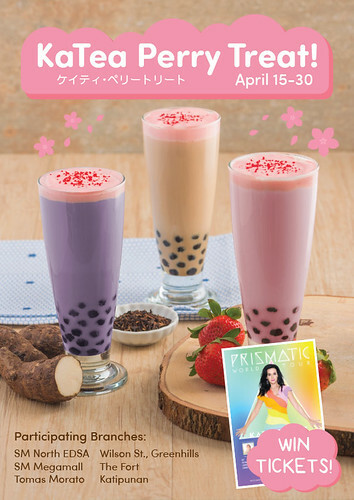 Click here for more info on the Tokyo Bubble Tea KaTea Katy Perry Prismatic World Tour Promo.